Empower those battling Leukemia, honor those taken and encourage others to get involved in the fight for a cure with our attention-grabbing Leukemia Awareness Ribbon Hooded Sweatshirt. Our Leukemia Awareness Hoodie is great for giving hope and spreading awareness so those living with Leukemia may lead effective and fulfilled lives. Our Personalized Leukemia Awareness Hoodie is available on our premium white cotton/poly blend hooded sweatshirts, machine washable in youth sizes S-L and adult sizes S-2XL. Includes FREE Personalization! 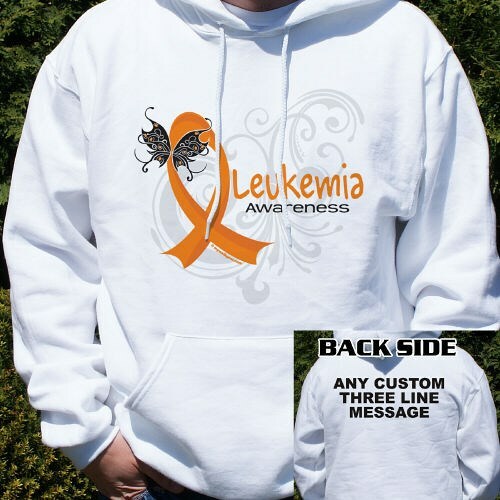 Personalized your Leukemia Awareness Hoodie with any three line custom message on the back. I loved the front of it, However the wording on the back is too small. I thought it looked cheap, but other than that I liked the sweatshirt. Additional Info MyWalkGear.com is dedicated to promoting Awareness for Leukemia, supporting those battling Leukemia, honoring those taken and encouraging others to get involved in the fight for a cure with unique Leukemia Awareness Walk Shirts and Walk Gear. Help us help those who need us the most with this inspiring Awareness Hoodie or our Personalized Leukemia Awareness Long Sleeve Shirt and our Leukemia Disease Awareness Key Chain. You will feel great knowing every purchase made MyWalkGear.com will donate a portion of the proceeds to end this disease once and for all.